Pictured left to right; 2017-2018 FCCLA Officers - Haylee Grilliot (Hospitality Rep), Gerardo Zamora (Vice President), Deja Mangos (Historian), Olivia Mett (President), Ryleigh Abney (Early Childhood Education Rep), Kyra McClure (Filling in for Ashley Brown, Secretary), and Briana Miles (Hospitality Rep). 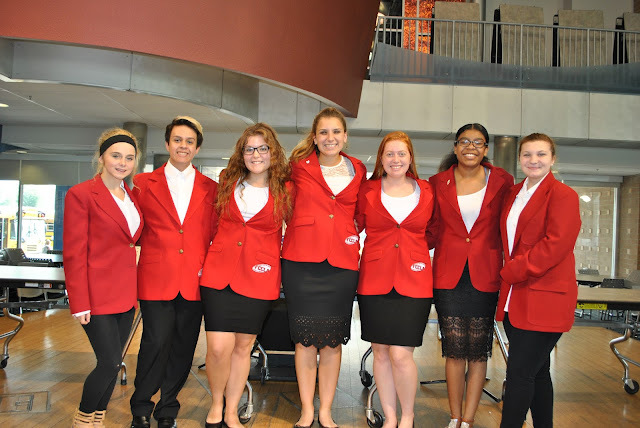 Englewood, Ohio – The Miami Valley Career Technology Center (MVCTC) FCCLA Chapter held the first meeting of the year on September 18, 2017. Bridget Herzog was a guest speaker. She spoke about the St. Vincent Homeless Shelter and ways to help them out. The FCCLA Chapter will be collecting items for St. Vincent during the Walk for Wolf In mid-October. The MVCTC FCCLA has a very busy year planned for 2017-2018 with students going to Fall Leadership Camp in October. They are also planning a collaboration with HOSA for The Walk for Wolf (No one Fights Alone). They are busy preparing for FCCLA District Competition, State Convention, and the National Leadership Conference. For more information about MVCTC, please visit www.mvctc.com. For over 45-years, MVCTC has been providing career technical education for 27 partner school districts encompassing five counties, including Darke, Miami, Montgomery, Preble, and Warren Counties. MVCTC is dedicated to providing in-demand workforce training for youth, adults, and organizations in the Miami Valley.